Since its founding in 1974, The Woodlands has steadily grown into a thriving community in which over 115,000 people live and roughly 64,000 are employed. Amazingly enough, through all of this development The Woodlands has managed to maintain a land ratio of 28% green space (that’s 5% higher than George Mitchell’s original vision for The Woodlands intended). This combination of urban development and conservation of the natural environment has developed The Woodlands into one of the most highly rated places to live and work in America, making its homes highly sought after and increasingly more valuable. 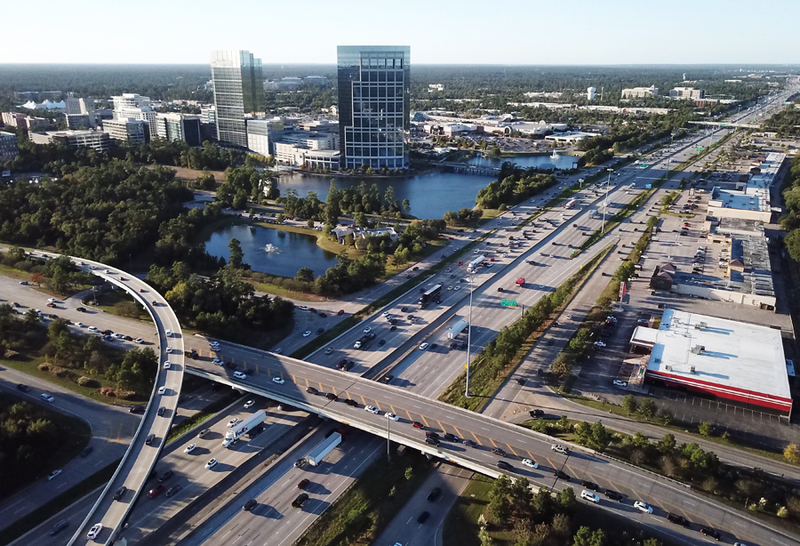 With one of the lowest crime rates in the US and relatively low tax rates in comparison to similarly sized cities in Texas, there is not much for residents of The Woodlands to complain about…that is besides traffic. 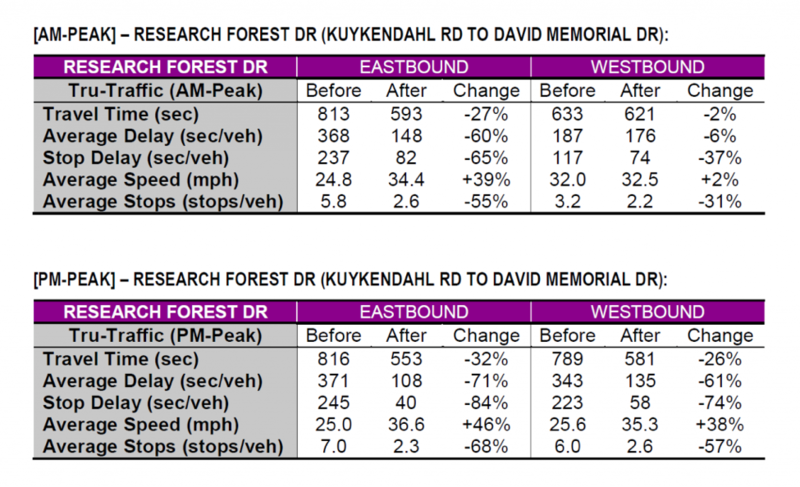 By updating signal timing, installing flashing yellow arrows where permitted, adding time-of-day plans to account for churches and schools, putting in different time-of-day plans for peak and non-peak hours, and decreasing cycle length, the office of the commissioner was able to decrease a majority of the wait times at lights on Lake Woodlands, Research Forest, Gosling Rd and Woodlands Parkway. These timing adjustments efficiently improved congestion in the short term at little cost. 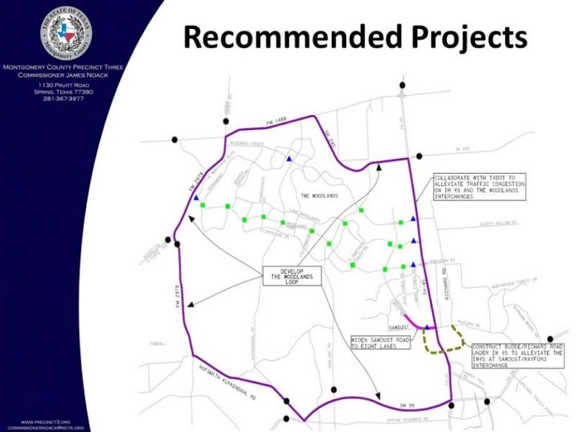 The Woodlands Loop would utilize federal, state, and local government funding to improve the connectivity and flow of traffic between approximately 34 miles of existing roads that surround The Woodlands including Interstate 45, Texas 242, FM 1488, FM 2978, Hufsmith Kuykendahl Road and the Grand Parkway. If the connectivity and flow of traffic between the roads that compose the loop are improved, then it will become faster to drive around The Woodlands than driving through. Theoretically, people traveling from one side of The Woodlands to the other would choose to take this longer but faster route, resulting in significantly less congestion inside The Woodlands during peak traffic hours.